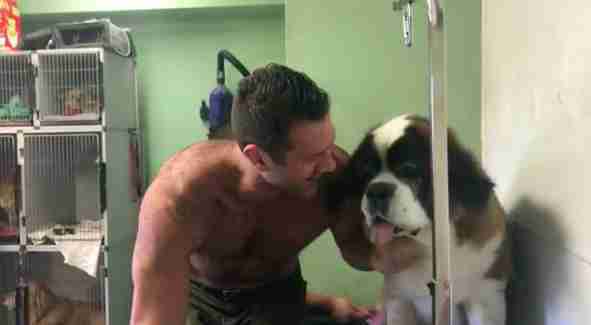 Despite being a very large dog, Lillie the St. Bernard still gets scared sometimes, and one of her biggest fears in the world is going to the groomer. For some reason, getting groomed freaks Lillie out so much, and her dad has tried everything to try and ease her fears. … so on a recent visit, her dad decided to take off his shirt, jump up on the table and get groomed right alongside her. … and it actually worked. Having her dad right next to her getting groomed too helped Lillie realize that it actually wasn’t so scary after all, and allowed her to relax a little while the groomer did his thing. “She started playing a bit and gave me a kiss which was like a, ‘Hey, thanks for coming up here,’” Asher said. … but of course, Asher didn’t care, because he was willing to do everything it took to make sure Lillie was feeling safe, and Lillie was clearly so grateful that he did. You can follow Lillie and her family on their Instagram account.